The last few years a number of events occurred in which Maitreya left a personal 'calling card.' In several issues of Share International magazine photographs of these phenomena were published, including the following explanatory comments. It is a fantastic hand. 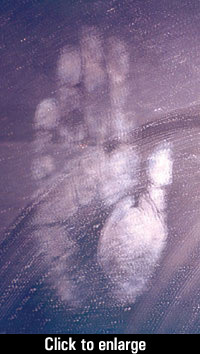 It is 'real', three-dimensional in appearance, similar to the print on the Turin Shroud of the body of Jesus after the Crucifixion. The image also has extraordinary healing properties, but not in the way you might think. In the case of the healing waters Maitreya has magnetized all over the world, the water itself is imbued with energy from the constellation Aquarius. 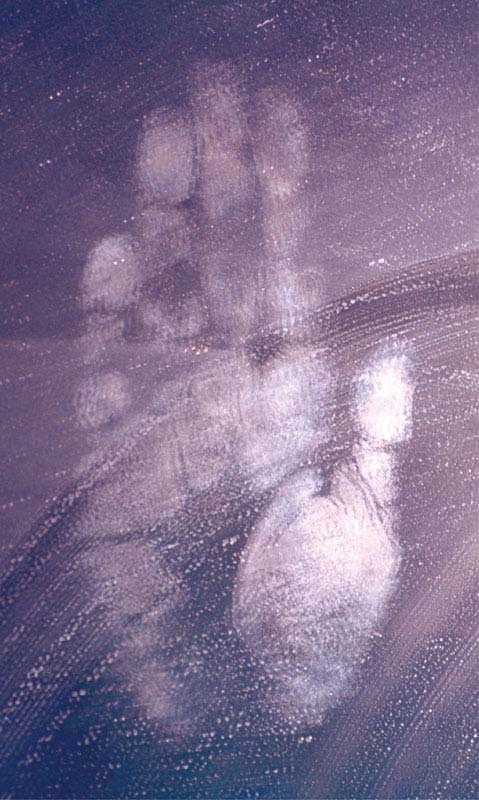 However, in the case of the image of Maitreya's hand, the energy does not reside in the photo, but is invoked from Maitreya when you place your hand over the image or simply look at it. You are, in effect, calling forth his healing or blessing or help – whatever is possible within the karmic law. The same effect can be produced even with a photocopy of the image. This is extraordinary. It makes Maitreya's energy, his help, in one way or another, available to whoever asks. If what you are asking is: "Dear Maitreya, would you please suddenly appear before me," I don't think that that is going to be answered. Every time he appears it takes energy. He has much to do, he has a world to save, and he won't want to waste that energy. I say this seriously, because I know people who give out the story that if you want Maitreya to do something you just have to ask and he does it. It is not true. Maitreya appears to thousands of people all over the world, but he does it in his own timing, and for his own reasons ― for reasons of helping people. 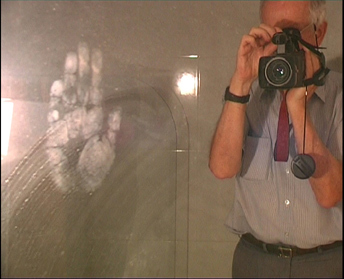 The appearance of the hand at this time has great significance. It means Maitreya is very near to coming out. Until we see his face it is the closest he can come to us. Message 90: My Hand shall guide you and protect you. Message 115: Take My hand, My friends, and let us walk blithely together into the radiant future. Message 123: Take My hand, My friends, and I shall take you to a New Country in which your true nature as Gods shall flourish. Message 130: Take My hand, My friends, and let Me lead you over the river. Message 132: Take My hand, My friends, and let us together walk that Path and know the meaning of Life, know the blessing of Love, know the purpose of God. Message 140: Take My hand and let Me lead you to God. At the beginning and end of every lecture Benjamin Creme is overshadowed by Maitreya for about 20 minutes each time. In this way Maitreya releases his energy to the audience as a special spiritual nourishment or blessing. Many people who have some degree of clairvoyance have seen this, but until now we have not had photographs of the event. 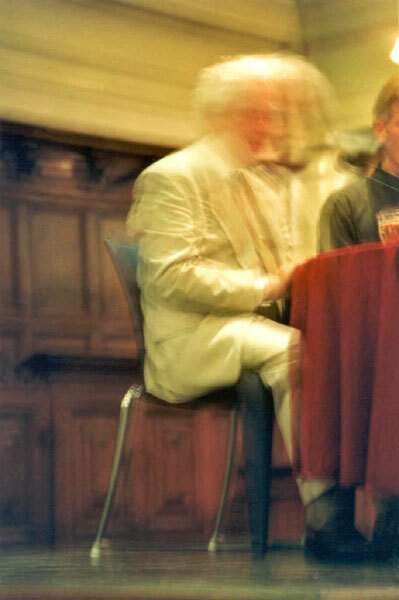 This photograph was taken on 26 September 2001 in Amsterdam at Benjamin Creme's lecture. 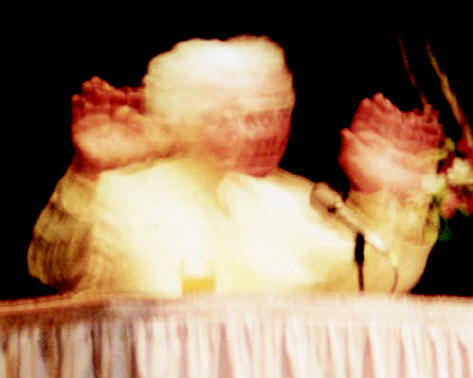 The photographer, Ellen Bernards, was sitting in the front row on the left of the hall and took the picture just as the initial overshadowing by Maitreya was beginning. When the photograph was developed she noticed that instead of two people on the platform ― Mr. Creme and the translator ― there are three figures. 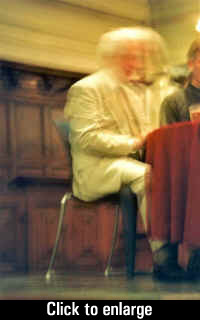 Mr. Creme, wearing a jacket and tie, was facing the audience, whereas the mysterious figure is facing the camera; he has no tie and the first few buttons of his shirt are open. The vagueness of the figures is caused by the light emanating from Maitreya during the overshadowing. Many people see Mr. Creme literally disappear behind the light.